Due to the current political climate, kindness and empathy are more important than ever. We know, however, that books can change a reader’s perspective and open a reader’s mind to a different world, a different culture, and a different way of life. In celebration of empathy and kindness, we’ve collected a list of recommended books that encourage kindness, giving, and open-mindedness. Today, we are celebrating the latest installment of our extremely popular Marisol McDonald series, Marisol McDonald and the Monster/Marisol McDonald y el monstruo. In this endearing bilingual story, Marisol confronts her greatest fear: monsters! Now that your stomach is filled with turkey, stuffing and cranberry sauce, it’s time to get ready for the December holidays! Here are some book recommendations and resources for the December holiday season. In Calling the Water Drum, Henri and his parents leave their homeland, Haiti, after they receive an invitation from an uncle to come to New York City. As they attempt to flee Haiti in a boat, Henri loses his parents out at sea, and after his loss can only communicate with the outside world through playing his drum. In this interview, author LaTisha Redding discusses how she tackles heavy themes in children’s books and what inspired her to write Henri’s story. November 19th is National Adoption Day! And to celebrate, we are highlighting books that help children learn about and reflect on how families come together. Step Right Up: How Doc and Jim Key Taught the World About Kindness is a biography of William “Doc” Key, a formerly enslaved man and self-trained veterinarian who taught his horse, Jim, to read, write, and do math. Together they became a famous traveling performance act and proponents for the humane treatment of animals around the turn of the twentieth century. In this interview, author Donna Janell Bowman discusses the power of Doc and Jim Key’s message of kindness and what inspired her to write about one of the most famous performing duos in the country. Can you believe it’s almost November? The autumn season is officially underway which means the holidays are right around the corner! Plan out your month with these book recommendations and resources to get you ready for the holiday season! 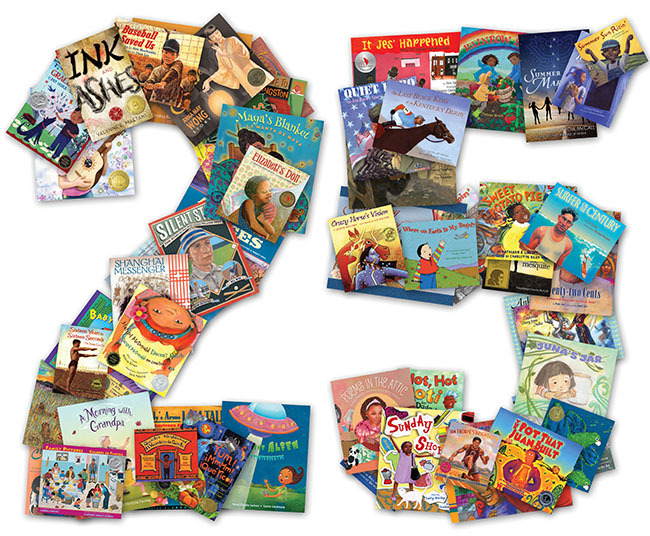 Thanks to movements such as We Need Diverse Books, #1000BlackGirlBooks, and vocal authors, writers, and readers, the conversation regarding diversity in children’s books has gained more traction. Studies such as the Cooperative Children’s Book Center’s Publishing Statistics on Children’s Books and our Diversity Baseline Survey have helped to supplement these conversations, highlighting the need for more representation in children’s literature. We’re starting to see more stories that represent people from different backgrounds and different ways of life, and stories with protagonists and heroes that finally look like us. Here at LEE & LOW BOOKS, our mission is to publish children’s books about everyone and for everyone. So today, LEE & LOW staff share the impact and importance of diversity and what diversity truly means to them. On September 28th, The Carle Museum hosted The Carle Honors Annual Benefit Gala in New York City. The Carle Honors is “the Museum’s annual benefit gala. At the heart of the Honors are four awards celebrating individuals whose creative vision and dedication are an inspiration to everyone who values picture books and their role in arts education and literacy.” This year, Lee & Low Books, represented by publisher Jason Low, was one of the four honorees recognized at The Carle Honors. Below are author Gregory Maguire’s remarks on the work and legacy of Lee & Low Books.